For a minute I thought I was in Nebraska | Where to next? 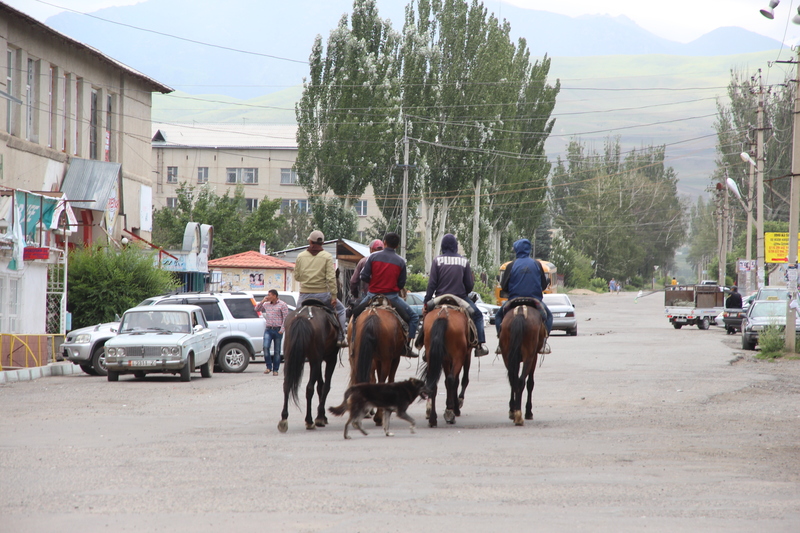 Karakol may be in eastern Kyrgyzstan, but it might as well be called the country’s Wild West. We were heading that way last week, travelling along the shores of Issyk-Kul Lake. 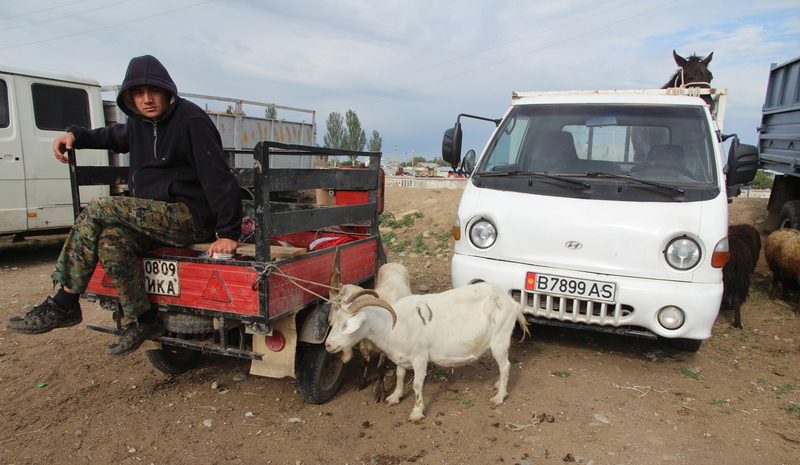 The plan was to camp about half-a-day’s drive short of Karakol. But the fact the weekly livestock market would be on the next day changed all that. The market has an early start—opening at 5am—and five hours later it’s all over. So we camped much closer and hurried ourselves along in the morning, making it to the market well before 8. Critters were everywhere—cows, bulls, calves, horses, foals, goats, sheep and more. The guidebook said pigs are also sold, but I didn’t see or smell any. Based on the sights and smells, I could have been in Nebraska except that my home state doesn’t go in much for goats or sheep, especially fat-tail sheep. We wandered around for more than an hour and never really figured out the actual selling process. There definitely isn’t an auction. Instead people seem to stand around waiting for prospective customers to come by and inspect their offerings. We noticed that the sellers were just as likely to be women as men, and that the amount of stock varied. Some people had a single animal. 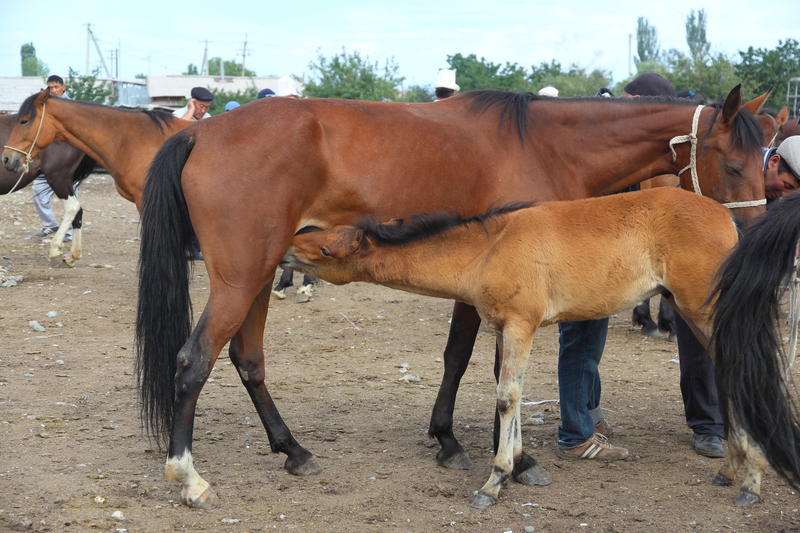 I saw a woman with just one snub-nosed calf (most cattle in Kyrgyzstan have short snouts, so it must be a breed characteristic). Others had many, but I didn’t see anyone with more than seven or eight animals. It was entertaining to see a couple of fellows trying to shepherd five or six uncooperative goats, on rope leads, through the crowds. We saw a prospective buyer cantering a horse through the crowd seemingly on a test drive. We didn’t see him leave with the horse. Andy had a chance to chat with a seller who wanted 70,000 som (about US$1400) for his horse. He said lean horses were more expensive and sold for riding, while fat ones went for meat. And don’t think that meat is for dog food. 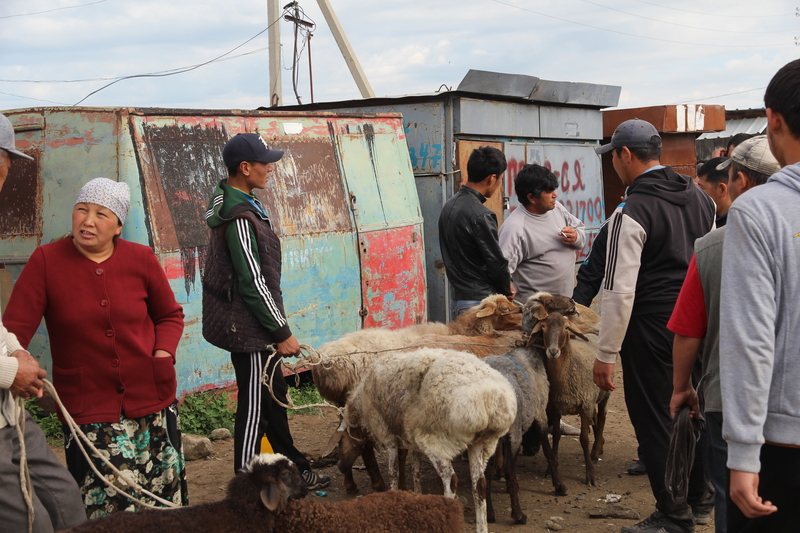 The Kyrgyz people love their horsemeat, especially sausages. They love horse milk too. I’ve tried both and prefer the sausages. The market had plenty of expected stalls. 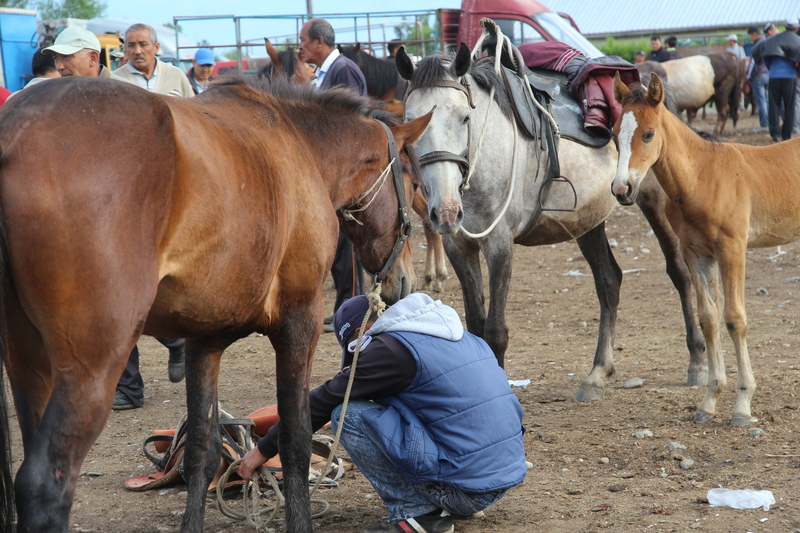 Saddles, ropes and tack were for sale, along with street food and drinks. Talbot entered the strong-man competition. It’s more about being able to hold your own weight. It costs 100 som to enter. If you can hang from a metal bar for 1 minute and 55 seconds, you win 500 som. If you last another 35 seconds, you win 1000. There’s a trick, of course. Talbot was doing so well when, at 1 minute and 15 seconds, he tried to adjust his grip. The bar rolls and Talbot was gone. The guy after Talbot lasted about five seconds, and the one after that made the same mistake as Talbot. So if you get there and enter, don’t move your hands. Just hang there until the time is up. We didn’t have to pay to visit the market, but it seems that buyers have to pay to get out. At every gate, we saw buyers wanting to exit and being hit for 20 som per animal. Buyers weren’t at all happy about this—it may be a weekly act—but the camouflage-clad money collectors acted rather mafia-ish and shooed me away when I tried to take a picture. Not to worry—I already had a few. After the market, Poor John and I headed off to see two very elaborate religious houses—the Russian Orthodox Church and the Buddhist-styles mosque. I’ll be back soon to show you both. That was a very interesting market. The numbers of livestock for sale are so small you wonder how anyone makes even part of a living selling livestock. And you’re a very adventurous woman eating horse sausages. I’d like to think that I’m open to new experiences and challenges but don’t think I could come at that! Well done! Loved the market. As for horse sausages, I prefer horse lunchmeat which is sliced very, very thinly. The sausage is a bit overwhelming, although Poor John loves it. Magic, magic, magic. What a world you have opened up for me. I love company on these trips, so thanks for joining me. Very nice, Peggy. Goats have become far more popular nowadays and out here anyway as goat cheese has become so much more widely accepted and desired. Wyoming & Colorado have always had sheep and I suspect a few more sheep in Western Nebraska. There is a lamb packing house about two miles north of downtown Denver that kills on average 1,200 lambs a day all year long five days a week with a spike to 2,000-2,500 lambs a day from late October through Easter due to the high demand from the Jewish population during that time of year in the Western U.S., 50% of the slaughtered lamgs are immediatedly shipped whole in refrigerated trucks with the other 50% cut up and distributed in the rest of the Western U.S. including your Omaha and of course here in Denver. I love buying their lamb in stores here as at least I know it’s local and hope it has not been around too long, in one state or or another. As you well know it’s so wonderfully tender and delicious when prepared correctly. I love lamb too, but have found good lamb very hard to buy when I’m in the USA. Nice to know about the Denver source. Could you feed 14 people dinner and breakfast for less than $20? | Where to next?